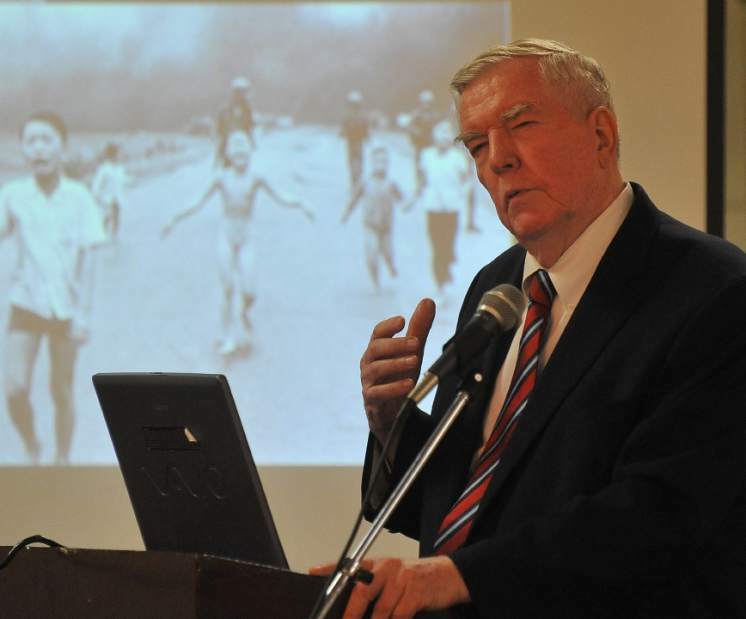 Retired Associated Press photo executive Hal Buell speaks to a crowd at the Eddie Adams Day dinner on Saturday, June 8, 2013, at the Clarion Hotel in New Kensington. Buell worked with Adams when Adams took his famous photo of an execution in the streets of Saigon in 1968. Here, he discusses another well-known photo from Vietnam of a napalmed girl running by photographer Nick Ut. Published: Sunday, June 9, 2013, 12:06 a.m.
Getting a state historical marker for New Kensington native and Pulitzer Prize-winning photographer Eddie Adams has been an objective of the New Kensington Camera Club since its creation in 2011. It's one the club hopes to realize about this time next year, club President Don Henderson said. Adams, who had a lengthy, prolific and varied career, is perhaps best remembered for the Pulitzer-winning image he captured of a South Vietnamese general executing a Viet Cong prisoner on a Saigon street during the Tet Offensive in 1968. The club hosted festivities for its second annual “Eddie Adams Day” Saturday, beginning with a program and display of his photos at the Alle-Kiski Valley Heritage Museum in Tarentum and concluding with a dinner at the Clarion Hotel in New Kensington. Adams' former editor, retired Associated Press photo executive Hal Buell, was the guest speaker for the dinner. Inspired by Adams' “signature picture,” Buell spoke of “Pictures People Hate,” images that make people angry with the newspapers that publish them. He had the audience play the role of editor, deciding whether they would print images considered controversial. Buell, 82, of Queens, New York City, retired from the AP in 1997. He said Adams did not like the photo for which he is best known. The reaction to the photo was bad, Buell said, not because it was graphic, but because it showed what “bums” America's allies were in Vietnam, and brought into question how the nation got involved with a country that would carry out an execution on a street. But Adams felt his own image portrayed the executioner, police chief Gen. Nguyen Ngoc Loan, badly. Earlier that day, Loan's aide and the aide's family had been assassinated by the Viet Cong, Buell said. Seeing no reason Adams shouldn't be honored with a historical marker, Henderson said only time has delayed it — a requirement for a person to be so recognized is that they be deceased at least 10 years. Adams died Sept. 19, 2004, making him eligible beginning next year. Proceeds from the Saturday events will go toward pursuit of the marker. Henderson said the club will apply for it in December. If approved, he hopes for a dedication ceremony including a street festival this time next year, which falls near Adams' birthday on June 12. Because Adams had been a Marine, Henderson said it would be fitting for the marker to be located at the New Kensington war memorial on Ninth Street, across from Peoples Library. Henderson said the club also hopes to have “Eddie Adams Day” made an official observance in New Kensington. Twenty-one photographs by New Kensington native and Pulitzer Prize-winning photographer Eddie Adams are on display this month at the Alle-Kiski Valley Heritage Museum, 224 E. Seventh Ave. in Tarentum. A $5 donation is suggested for those who are not members of the historical society. The photos can be viewed from 11 a.m. to 3 p.m. June 12, 15, 19, 22 and by appointment. To schedule an appointment, call 724-224-7666.